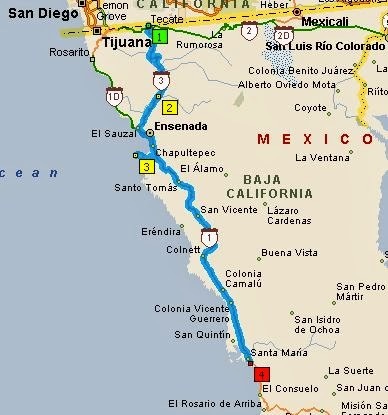 Forum friend Carol (traveling with her husband, Bill, in mainland Mexico) made this map showing our route as far as San Quintin. Mitch and I left our beach campground to ride into and explore the city of San Quintin. On the dirt road leading back to the highway we pass this place. It appears to be a drug and alcohol rehab center. Mitch stopped to look at this park. Driving down the main street...everything is covered with dust...a reminder that this is the desert. We parked near this grocery store. All we bought was hamburger buns, but it was interesting to see how food was displayed. Raw chicken piled in a bin with no wrapping, for example. Or, you can buy your chickens here, live. From chicks to laying hens. This is a tire store. There seems to be one on every block, and every few miles on the highway. They all have stacks of old-looking tires, but probably have your size if you need one. In the middle of the block is an oasis...a house with a well-tended (and watered) garden. We stopped for lunch in one of many cafes. This one was very clean, and the food was yummy. My shrimp taco and coke cost about $2.50, US. We saw this sign and thought it would be interesting to check it out. I have read that there are 8 small volcanoes that shelter the area from the sea. We started to walk, following the "sidewalk" in the direction the sign pointed. Behind the wall on the right is a military post. We decided it was too far to walk and went back for the truck. The road got too rough, so we gave up on the volcanoes and turned around. We passed this neighborhood. Back on the highway we passed this "auto parts" store. Next to the restaurant is an olive grove. Which is also an RV park. Campers park between the rows of olive trees. The hotel and restaurant are well landscaped. We didn't go inside. It's typical to see horses and cows grazing near the road with no fences. But where there are fences, most any material may be used. I guess this is a privacy fence. Back on the road to the campground, Mitch pulls way over as we meet a car. This is the "laundry" facility at the campground. Hey, but it's free. And the sometimes hot showers, unless you're the last one to use it like I was. But some things are priceless. While the poverty is plain to see, I must say that what I noticed was Mexicans working in the fields and stores, or setting up booths along the road to sell what they have grown or made. What I didn't see were people standing on every busy intersection holding signs asking for money like I see in my own hometown. Everyone I've met has been friendly and polite, and appreciative of our business. And now we are off to a new adventure.